Who doesn’t love a hot and crispy breakfast or an afternoon bite of crepes dripping with ice cream? You can make these delicious snacks eight at home if you have the proper devices. 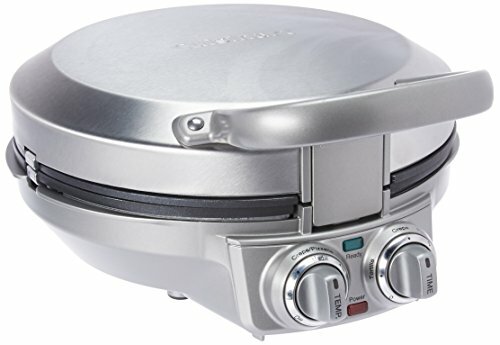 Cuisinart CPP-200 is a 3-in-1 crepe, pancake and pizzelle maker that is quite popular among homemakers and professional chefs alike. This stainless steel device is very durable and requires very little maintenance. Thanks to the stainless steel design, this crepe maker is very easy to clean too. The heating plates have non stick coating. It’s very easy to clean this surface with a cloth. You can also remove the plates to wash by hand or in the dishwasher. The coating does not come off easily. You can use the crepe maker for years with regular use before the plates require replacing. In addition to the sturdy built, this crepe maker offers a number of cool features. The lid locks securely, so it’s easy to carry and store this device compared to other crepe makers. The gadget is also energy efficient. The package is sold with necessary equipment like measuring spoons and tongs so you won’t have to buy these extra. Overall, Cuisinart CPP-200 will be an excellent addition to your kitchen. 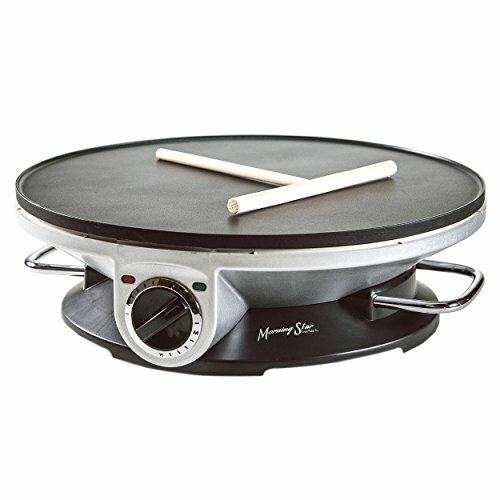 This crepe griddle has an above average cooking surface with a circumference of 13 inches. You can make crepes as big as you want or as small as you want. The grille is conveniently nonstick and very easy to clean. The rest of the body is made from steel that is resistant to rust. You can store it away for months and not worry about the exterior deteriorating. The crepe maker package includes a spatula, ladle, rake and even a recipe booklet to so you can start making delicious crepes right away. The griddle heats fast and cooks fast so it’s highly recommended to busy homemakers. This crepe maker is extremely easy to use and you don’t require any professional knowledge. Prior experience in making crepes is not necessary either. 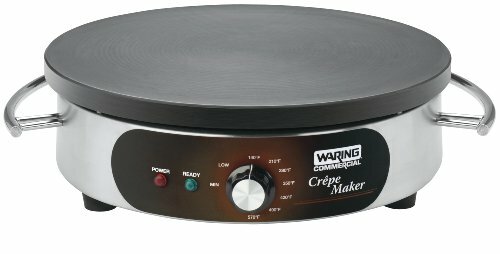 This crepe maker does not have a closing lid like many others. While that can be inconvenient when storing, it makes cooking large crepes quite easy. A cleaning brush is provided to clean the griddle safely without scratching the coating. Made in France, this is a high-quality crepe maker you can count on for years. Complete kit includes ladle, rake, spatula, recipe booklet, brush, spreader device. If you want a crepe maker that can handle high demand, choose this one. Waring crepe griddle is intended for commercial use at places like restaurants. It’s sturdier than usual, so it’s perfectly suited for domestic use as well. It features a generous 16-inch cooking plate that can reach temperatures up to 570 degrees Fahrenheit. The large surface evenly distributes heat to make the perfect crepe. The cooking plate is heavy-duty cast iron, so it heats up in no time and makes crepes in seconds. It’s perfect for busy and large households as well as small eateries. This crepe maker has a thermostat that is adjustable. It’s very handy when you want to cook different types of batters that require varying degrees of heat to get that perfect crispy or smooth texture. The base of the device is stainless steel. The handles are heat resistance so you can lift it when heated without the need for kitchen mitts. The base includes an LED bulb to indicate when the cooking surface is ready to make crepes. This crepe make is powered by 1,000 watts. Yes, it’s quite powerful and can make crepes or pancakes in a matter of seconds. The cooking plate is a massive 12.6 inches. Despite the large surface area, it heats quickly and evenly distributes the temperature. Heat is also retained adequately to cook dozens of batches of crepes or pancakes. The temperature dial ensures precise heat control as you wish. It has a number if LED indicators to notify the cook when the plate is heated to the set temperature or when it has cooled down. The plate is nonstick aluminum, which makes it particularly durable compared to other types of griddles. 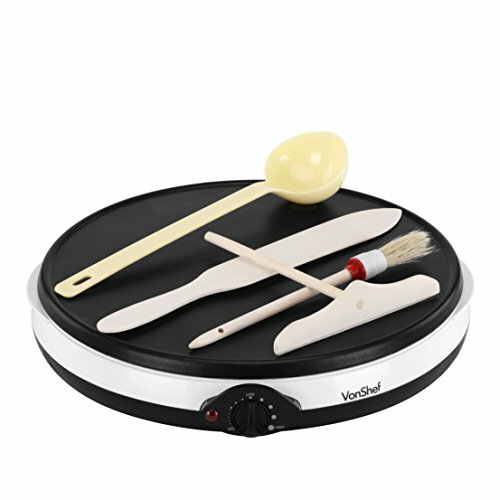 VonShef crepe maker comes with a number of useful accessories including a spreader, spatula, ladle and a brush for oiling the cooking plate. Cleaning is very easy. You can do it with a cloth. The cooking plate cannot however be removed for hand washing or for the dishwasher. But it’s not really necessary. You can just wipe down the cooking plate with a wet cloth before and after use. No need to use harsh chemicals. VonShef Professional is convenient and is perfect to make large batches of delicious crepes for the whole family. Wide 12.6" cooking plate - made from non-stick coated aluminium for convenient cleaning. 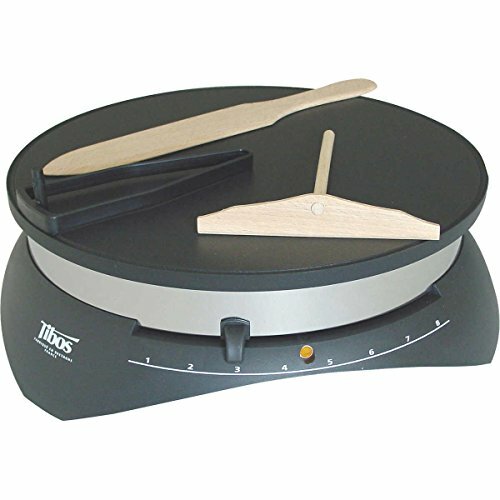 NEECO is a state-of-the-art crepe maker with a large 13-inch cooking pate. The device is professional grade, so you can use it heavily for years and it will last. The body is very sturdy and is made from premium material. This crepe maker offers precise temperature control varying from 250 degrees to 475 degrees Fahrenheit. The nonstick cooking surface heats up without a hassle and distributes heat evenly. In addition to crepes, you can use the surface to make packages, eggs and French toast too. Cleaning is easy. No removable cleaning is possible but you can tilt the cooking plate to the side with a handle and wash properly. Usually, cleaning with a damp cloth is enough to remove oily residue from the cooking plate. The crepe maker is very easy to operate and requires no prior knowledge. There are useful indicator lights to show when the cooking plate is on, when it has heated to the set temperature and when it’s cooling down. The crepe maker comes with a free wooden batter spreader to make your crepes perfectly thin as you like. It’s a convenient device that will not give homemakers any trouble on busy mornings. Large 13 inch aluminum non-stick plate is also ideal for pancakes, eggs, and much more! Conclusion: The above crepe makers all offer similar functions. Choose a device based on what you need. Operation for the devices is quite similar to each other. So, base your decision on the size and the material of the cooking plate. A large cooking surface will allow you to make huge crepes, but storage might be difficult. If you want to wash the cooking plate in a dishwasher, you choose a crepe maker with a removable plate. Some devices are offered with a number of free accessories that you can definitely benefit from. Make your choice based on your budget, needs and the features on offer.